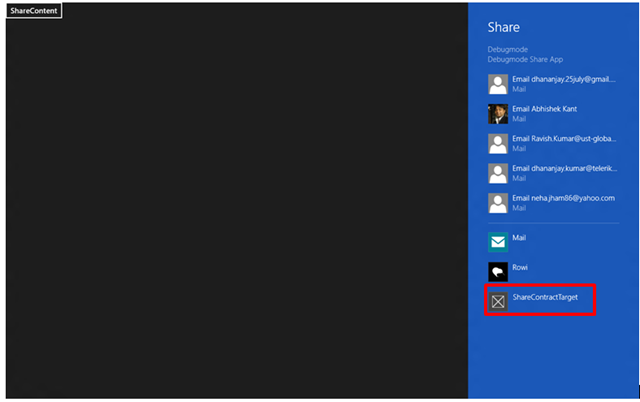 Two Metro applications can shared the content between them using Share Charm. Content can be as simple as text or may be image or a file. In content sharing, the application that shares content is called as Source Application and the application that receives content is called as Target Application. Source Application and Target Application need to declare the type of content; they are intent to share in a Declaration. Declaration can be configured in the package.appmanifest file. Click on package.appmanifest file and then select Declaration tab. From the Available Declarations drop down select Share target and check SupportedAnyFile Type in Supported File Types. See the image below. After configuring the declaration we need to write the code to share relevant text. Let us put a button and click event of that button we will share the text. Function to share text is as following. User can share the text from the Share Charm. 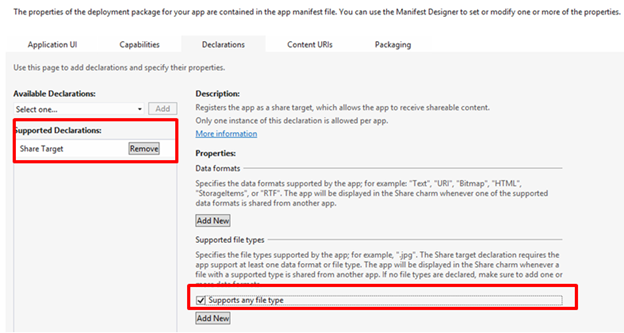 Note that in the code below, we have explicitly displayed the Share charm by calling function showShareUI. Now let us create an application, which can consume the shared text. An application can be launched in multiple ways; we need to first check whether the application was launched as Share Target or not before accepting any data. Below is the code required to read the text shared and display in an output div. 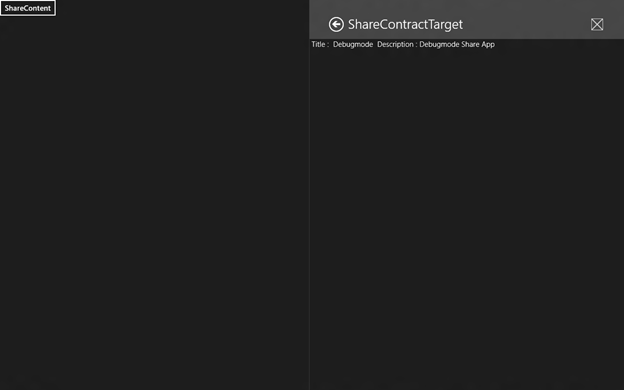 In this way text can be shared between source application and target application using shared contracts. When you run the source application, you will get a ShareContent button. On clicking of the button Share Charm will get displayed. You will get list of all applications can act as Target Application. For example Mail application can also act as Target Application. Let us choose target application we created. Click on ShareContreactTarget application. You can see two applications can run side by side and text from source application is displayed in output div of target application. In this way we can share Text between two metro applications. I hope you find this post useful. Thanks for reading.